As it turns out brand name corporate partners may be able to provide a reciprocal halo effect to non-profits, too. 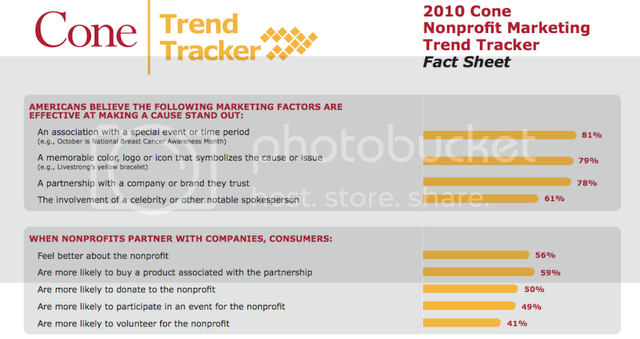 According to the Cone Trend Tracker, more than three-quarters (78%) of Americans believe a partnership between a nonprofit and a company they trust makes a cause stand out. The study also found that fewer than half of consumers (45%) think nonprofits and companies disclose enough information about their partnerships. 75 percent want to hear about the results of partnerships, including the effect on the social issue or money raised for the cause. All of this leads to the question, should properties, non-profit and otherwise, think beyond the upfront corporate partnership fee to the validation with peer corporations, consumer awareness benefits and call-to-action potential that corporate partners can provide?